NEW YORK -- Elisa Schindler says she is relieved her father, the late Rabbi Alexander Schindler, didn't live to see the destruction caused by Wall Street swindler Bernard Madoff. 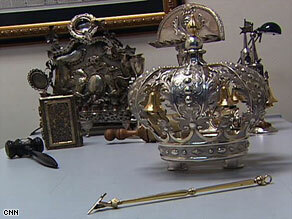 The antiques include a rare U.S.-made silver "Torah Crown" and a "Torah Pointer" possibly from the 1780s. "Here's a man who dedicated his entire life to making the world a better place and contrast that with a man who didn't do that," she says. Rabbi Schindler, who died in 2000, was a prominent clergyman who was a leader of Reform Judaism in the U.S. His eldest of five children, Elisa, says he invested his life savings with Madoff in 1996 but never met him. With everything wiped out, Schindler's widow, Rhea, now must sell their family home in Connecticut. The family also is selling two sacred pieces of Judaica given to the rabbi as a retirement gift. Pieces, say Schindler, that would have been passed down to her sister who is a rabbi in Charlotte, North Carolina. "I think that my father was extremely pragmatic, as are we, and we realized these were items we could part with, and needed to part with, in order to ensure that my mother would have the security she needs." The pieces include a silver "Torah Crown," likely made in the United States in the 20th century, and a "Torah Pointer" that dates back to as early as 1780, according to Jonathan Greenstein, an auctioneer specializing in antique Judaica. Greenstein says the "Torah Pointer" or "Yad" comes from the Netherlands and very few such items survived the Holocaust, adding "It's extremely rare, extremely, extremely rare." "I'd like the new owner of these two items to use them in celebration, not sadness," Greenstein says. "It should not be ruined by Bernie Madoff or any other negative history that can be connected to it, but should be admired because it belonged to Rabbi Schindler," Greenstein says. Elisa Schindler turned to Greenstein to sell them because "whether these items would end up in a private home, whether they would end up in a museum or with a synagogue, we just knew they'd find a fitting home." While she admits it's heartbreaking, Schindler also reminds herself of other struggles her family has endured. "My father came out of Nazi Germany," she said. "His mother once told me when she came out of Germany, 'What's in your mind and what's in your heart, they can never take away from you.' And that's a lesson that's always been with me. ...Nobody can take that from you. And the rest of it is just things."